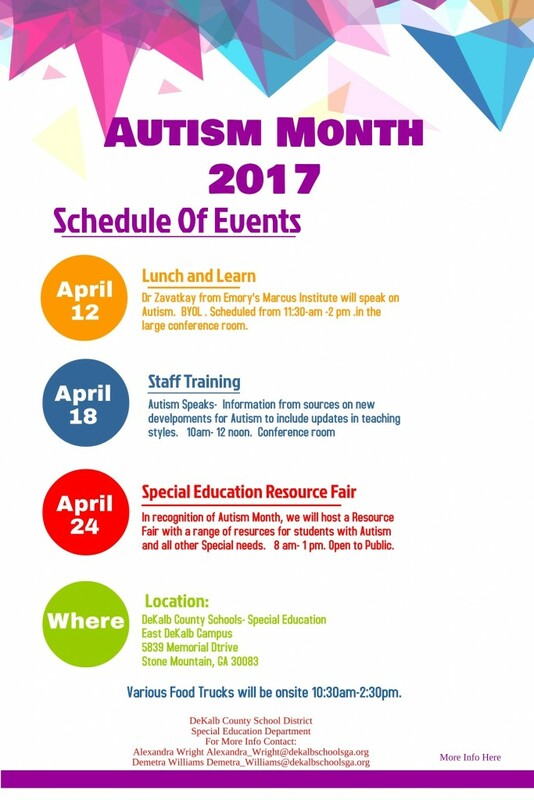 DeKalb County School District (DCSD) joins families and organizations across the nation in recognizing April 2017 as National Autism Awareness Month. This is an opportunity to honor children and youth with Autism and the professionals who serve them. April 12, 13, 18 & 24 – Food Trucks at the East DeKalb Campus located at 5839 Memorial Drive, Stone Mountain, GA 30083. The food trucks will be on site from 10:30 a.m. to 2:30 p.m. Donations are also being accepted. April 24 – Special Education Resource Fair from 8 a.m. to 1 p.m., East DeKalb Campus located at 5839 Memorial Drive, Stone Mountain, GA 30083. A wide range of resources regarding Autism and other special education needs.